Eliminating the barriers that stand between users and information is an endless goal for Google. The company continues to revolutionize the way users search the internet and strives to provide only the most relevant and superior content possible. On Tuesday June 14, 2011, Google held a media event in San Francisco to announce their new features that they hope will drastically change how users will search the internet. Among the features that were announced were Instant Pages, Search by Image, and Voice Search. At the event Google also shared their latest search statistics. The stats showed that mobile search is following the same usage pattern as the early years of Google desktop search. Within the past couple years mobile searching has grown tremendously and with technology like voice recognition, mobile searching is expected to grow even more. Google believes that voice recognition is a technology that shouldn’t be limited to the mobile experience and that is why Voice Search is now available on a desktop. Their voice recognition is currently comprised of over 230 billion words or phrases and each day their system captures over 2 years’ worth of voice searches. Voice search allows users to effortlessly speak what they are looking for and Google will find it, searching doesn’t get any easier than that. 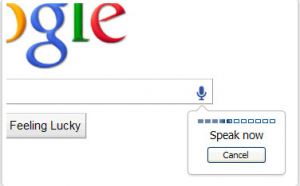 Voice search also helps out when users need to perform searches that are longer, more complex or harder to spell. Google Chrome 11 or higher and a microphone are required to use Google Voice Search. From there, voice searching is as easy as clicking on the small microphone button located by the search bar and speaking your search terms. Google +1, How Is It Measuring Up to the Like Button? Back in March Google began rolling out their +1 feature locally on their Google results page. The new feature enables users to activate the Plus 1 button when they wanted to recommend a website to other users. Since Facebook did not want to have their Like Button located on the Google search results page and chose to showcase it on Bing instead, Google has taken action and created its own way to boost social interaction. Similar to the Facebook Like Button, the plus 1 feature lets users put their stamp of approval on a website. Exactly one week ago on June 1, 2011 Google announced that they are now offering the +1 button to website developers to place on their own content. On the day of the announcement the +1 buttons started appearing on major websites like Bestbuy.com, TheHuffingtonPost.com, and Nordstrom.com. After only a week the button now appears on large and small websites all across the Internet. Websites can display the button and enable people to recommend their website, blog or even individual products. Already the Google +1 feature seems to have a solid foundation but it continues to work towards being as widely used as its Facebook counterpart. From what we can tell here at Internet Beacon, the Google +1 button is being used frequently on the search results page but doesn’t quite yet have the exposure necessary to properly compete with the Facebook and Twitter sharing buttons that are on individual websites. In time this could change drastically, after all the button is only a week old. 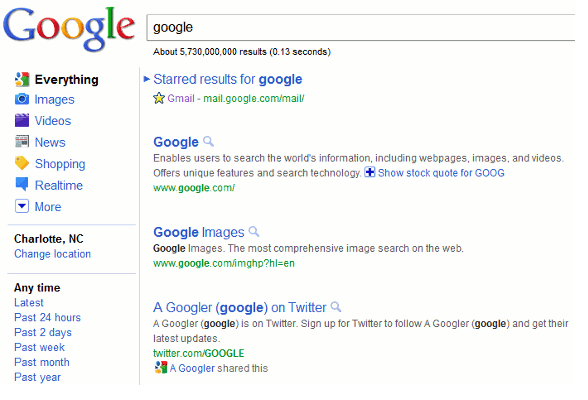 Recently Google has begun testing a new search engine results page (SERP) with a limited group of Google users. It is unknown what criteria Google used to determine which users were given this opportunity and because there is no opt in for testing most users can only experience the new page via screenshots. It remains unclear whether or not Google will further expand this sample testing or even continue in the same direction once they acquire usability feedback. Due to the limited testing being fairly recent no real results have been released other than the initial feedback from users that the new page is ugly or that it looks better, which really depends only on the users taste and not the designs usefulness. For the users that were not selected to participate in the new search results page trial you can view the changes at Google’s New Search Interface. As you can see from the screen capture it seems that Google has eliminated or scaled down the amount of information provided for each search result. The text has also decreased in size and appears cleaner with more white space. The older results page features a darker blue, green, and purple text color whereas the new page showcases brighter but muted pastel colors. The new colors go a long way to make the page look prettier but don’t offer the same contrast as the old page and instead can make it harder for some users to view because the bright on white color scheme. In addition there is also less page identification because the page title is no longer underlined.